I am very excited to announce a book focused completely on “Design Patterns” in Apex, written with my colleague Anshul. This book starts with explaining basic concepts of Object Oriented programming like Inheritance, polymorphism, abstract classes and OOPs principles. Assuming readers are new to Apex and OOPs, first chapter gives them firm start by understanding important concepts that is being used later in this book. Intermediate level developers, who already have working experience in Apex, may find many situations they faced in past project and how we solved it with the help of design patterns in this book. There are many important notes and hints for advance Apex developers as well in this book which explains concurrency, some of the anti patterns and best practices to follow. Often design patterns are hard to understand however, Anshul and I tried our best to keep this book as simple as possible, by relating examples of design pattern with real life projects and problems. I would be discussing questions and feedback from readers on this blog about various patterns and examples taken in the book. Hope, you would enjoy this book and it would prove to be stepping stone in your career to design Force.com application better in future. John M. Daniel did a fantabulous work on reviewing this book. He suggested many improvements to help better understand readers. John (@ImJohnMDaniel) is Technical Architect working on Salesforce platform, and have reviewed many Salesforce books, published by Packt. very interested in this. I’d suggest adding the word Salesforce somewhere in the Amazon description or title. 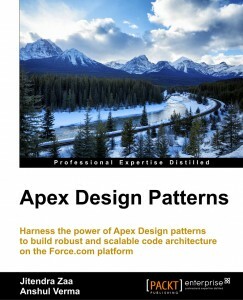 I did a search for Salesforce Apex design and didn’t see this book in search results. Thanks for suggestion. Would ask publication if that’s possible. Being Salesforce as a company name, hard to convince them, However I have added it in my post. Packt team in onto it,It should be done soon. Thanks for bringing this up. Waiting for this one. I already saw this cover before Anshul(who happens to be my manager) told me about it. Do we have any date of its release? @CommonIntellect:disqus Hope you found it already !!! Well done and congratulations! Excellent edition to the eco system of Salesforce developers! I have linked to it from my blog sidebar. Thanks Andrew for adding on your blog. I am new to Salesforce, like your blogs , I follow them on regular basis I want to know how to subscribe your blog.